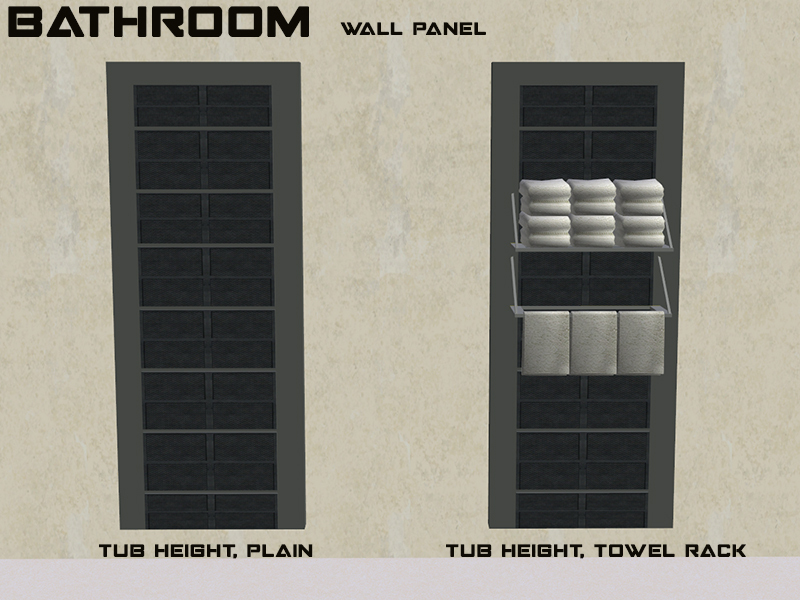 Important Update 3/17: I discovered a minor issue with the master wall panel and the toilet (the objects only had one recolorable subset each). I fixed the issue and the links. Please re-download. Today, I present a huge update. There are over sixty objects in total. 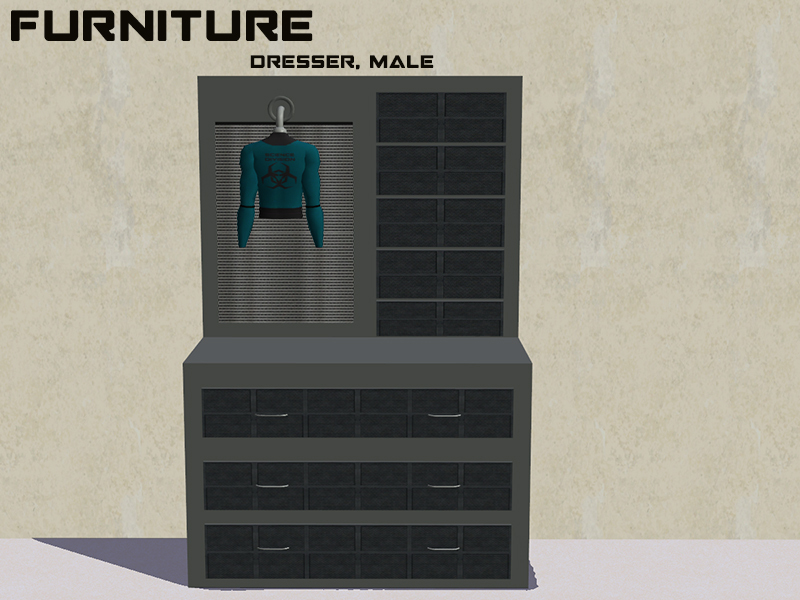 This isn't really a themed set; it's just a massive furniture set for all your Sim's crew quarters needs. 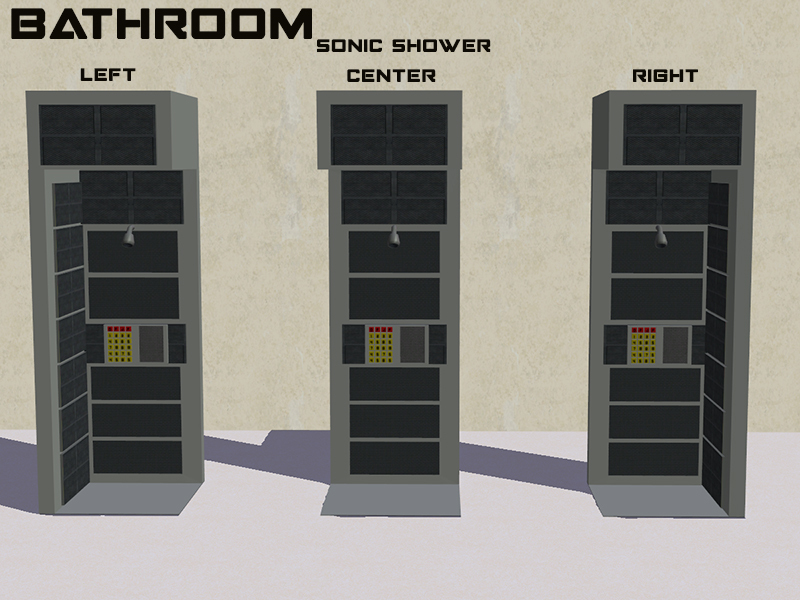 Bathroom: Three conventional (community) showers, three sonic showers with special effects, a bathtub, two deco wallpanels, two bathroom shelves, three bathroom alcove shelves, a sink, a toilet, and two mirrors. Beds: Three place-anywhere mattresses, two bases, and three bunk bed components. 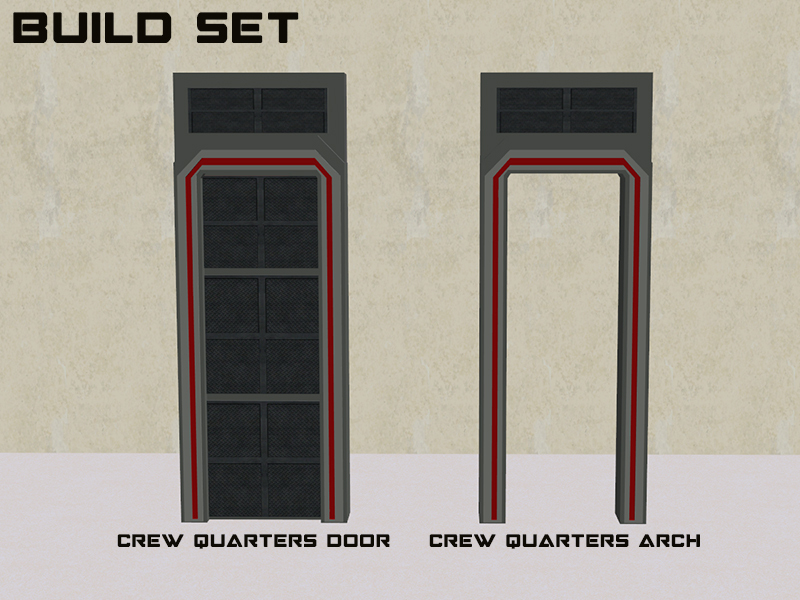 Build Set: Two doors, an arch, and a window, all with diagonal objects. 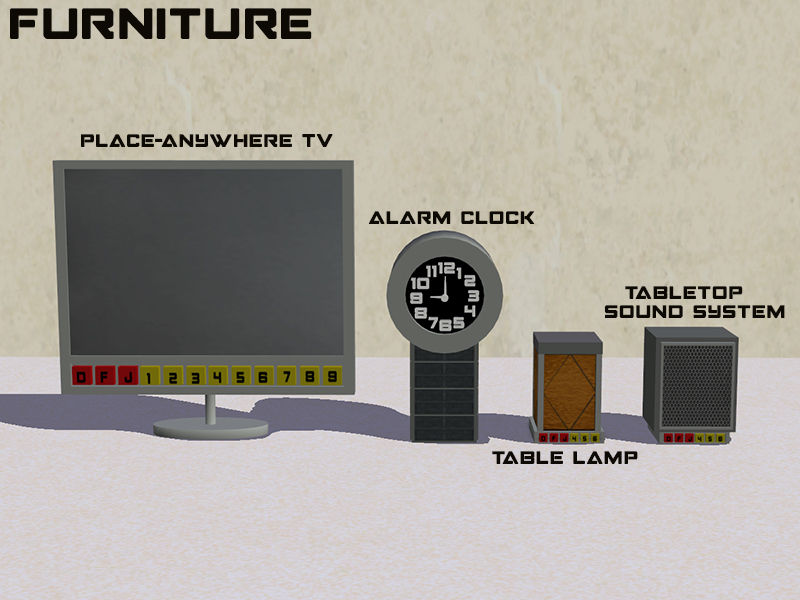 Furniture: A desk chair, a desk, a computer, a nightstand, three lockers, three dressers, two bookcases, a place-anywhere TV, an alarm clock, a table lamp, a sound system, a living chair, and a loveseat. 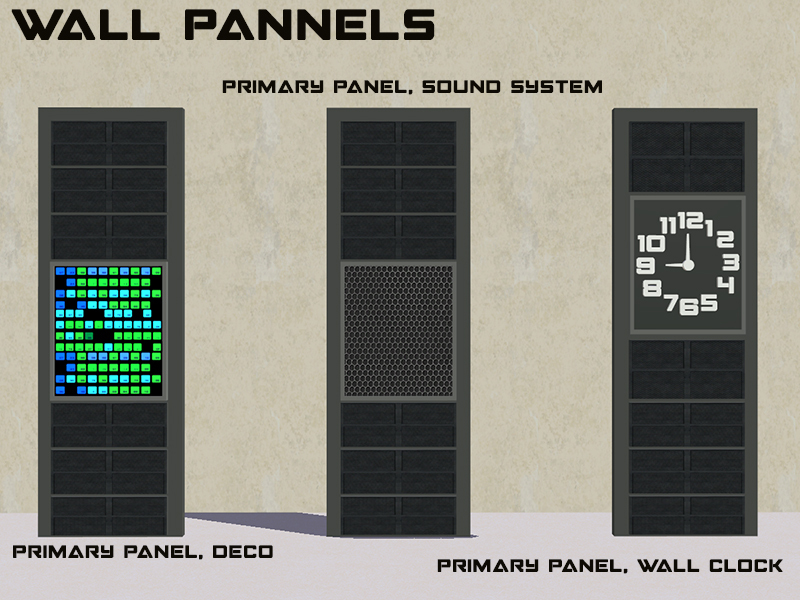 Wall panels: Six deco panels, five wall lights, a wall clock, and two TVs. Bedding recolors: I have included division-appropriate recolors of the bedding. 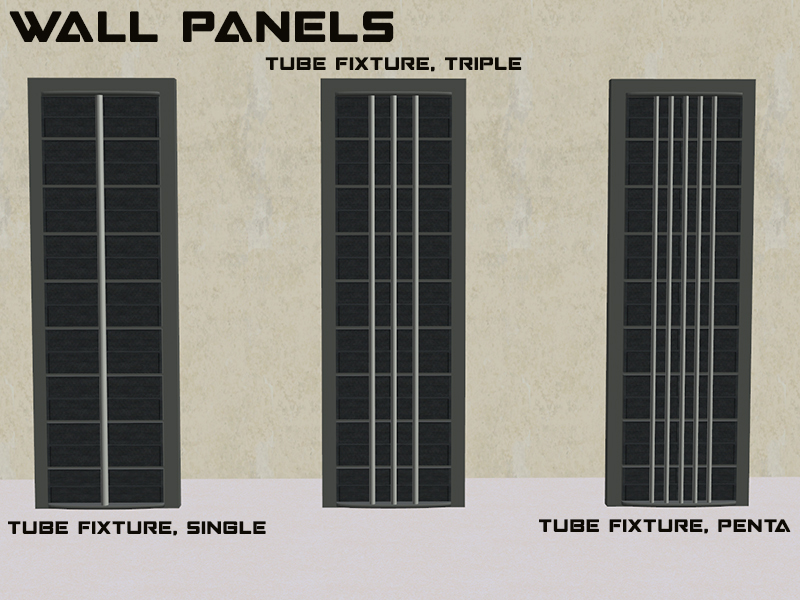 I've included the master objects for the base and monitor textures in a separate folder. You don't need them if you already have Midnight at the Cryo Lab installed. 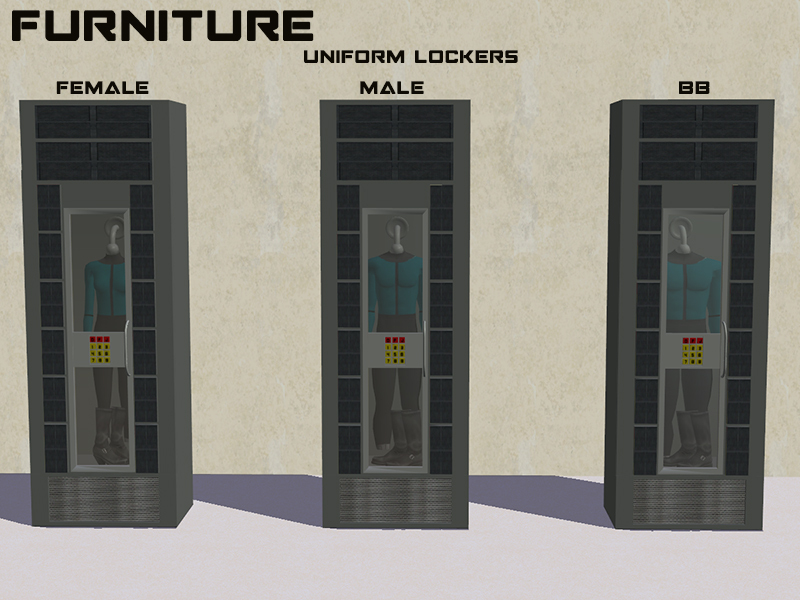 SynapticSim for the original deco uniform objects and for providing permission to share them. Buggybooz for the original alcove shelves. 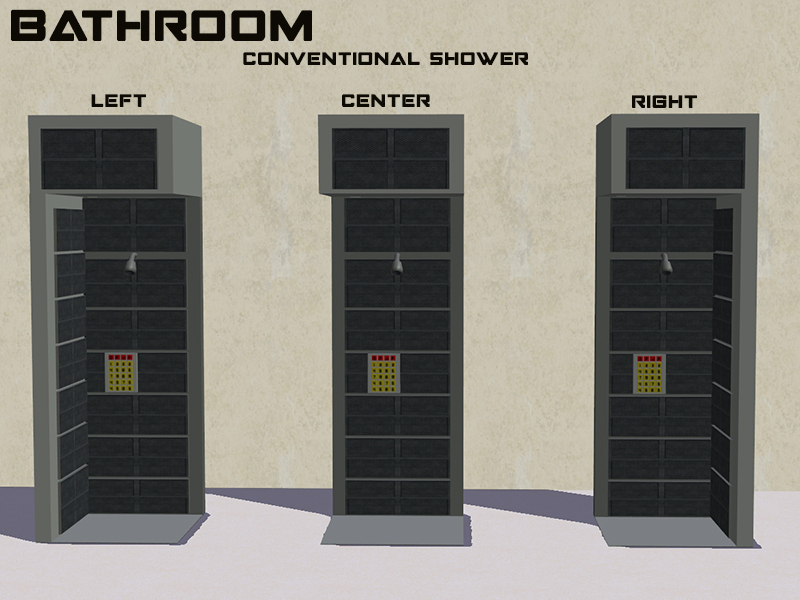 Egghead stuff: They work just like the UNI community shower. Egghead stuff: The temp control panel (next to the keypad) is coded with a special effect that comes on when the shower is activated. 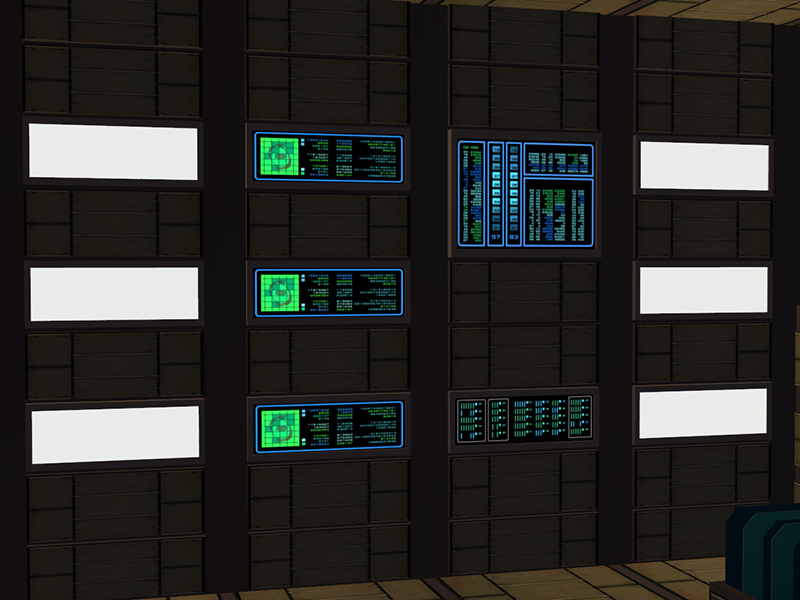 I moved the routing slot back a little bit so that the sims don't clip into the wall. The annoying abduction effect noise has been replaced with regular shower noise and the annoying alien loop effect has been replaced by regular steam. Egghead stuff: No major functional changes. Egghead stuff: They work like regular shelves, but I added more slots so that they're able to hold three deco objects on each shelf. Egghead stuff: No major functional changes. They work just like Maxis objects. 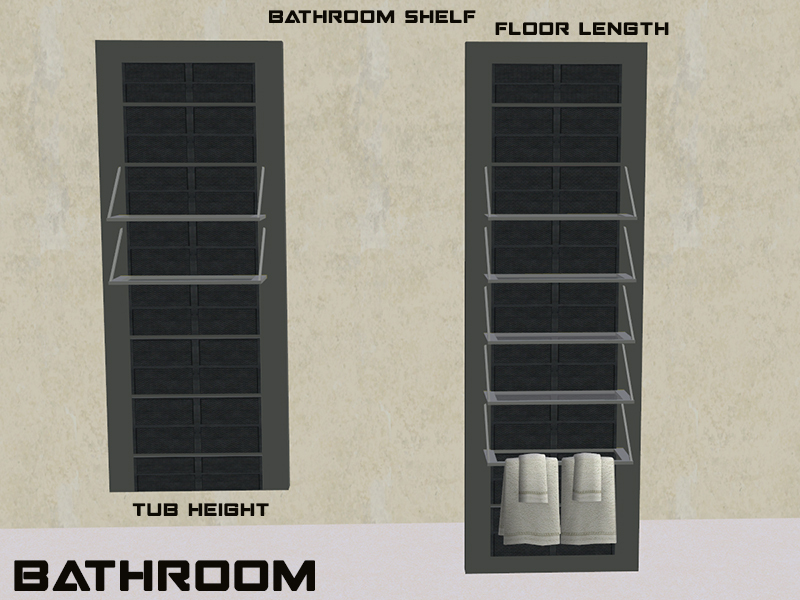 Egghead stuff: They work like regular shelves. You can fill them with your favorite bathroom clutter. 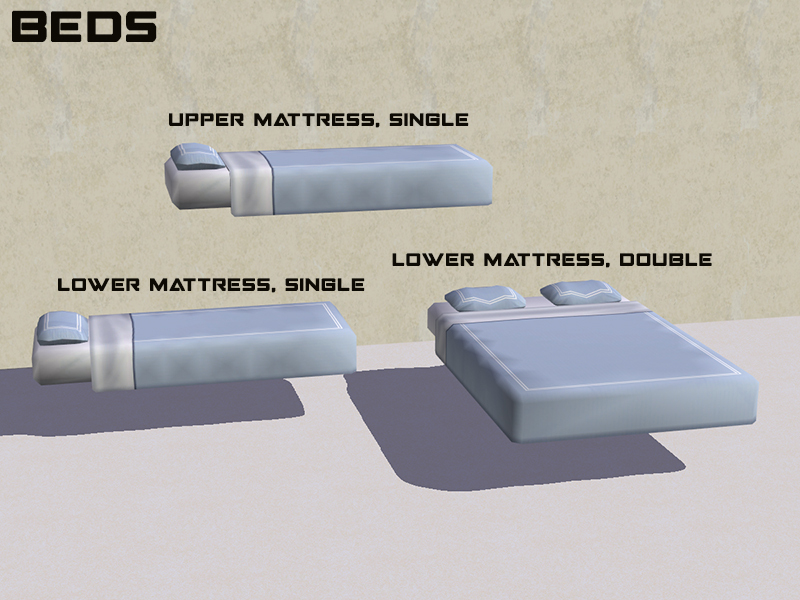 Egghead stuff: These mattresses are place-anywhere and can be stacked on deco objects. 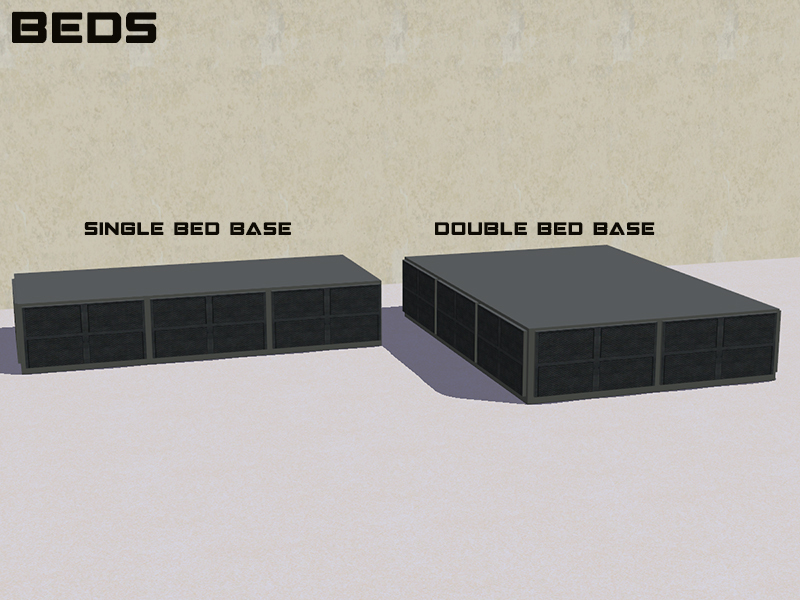 Egghead stuff: The are deco bed bases. 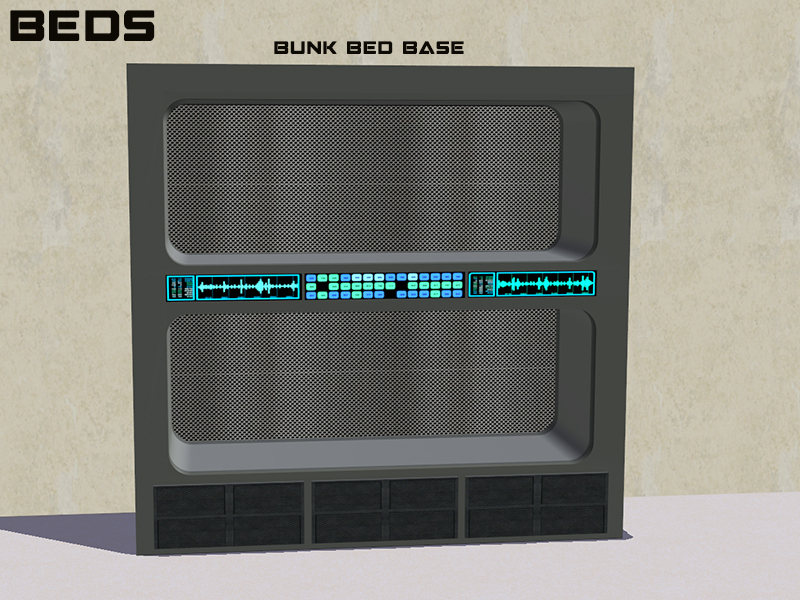 Egghead stuff: The are deco bunk bed components. 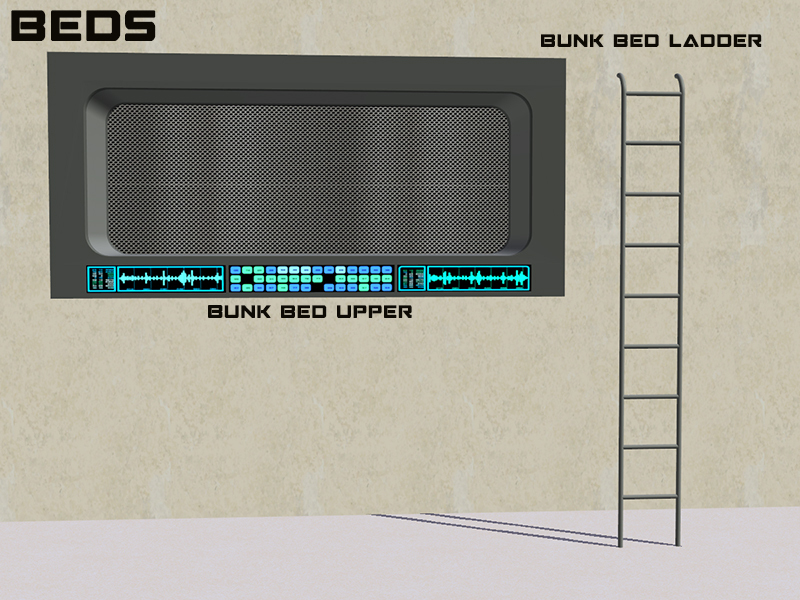 The bunk bed upper and ladder are place-anywhere and can be stacked on the same tile as other objects. 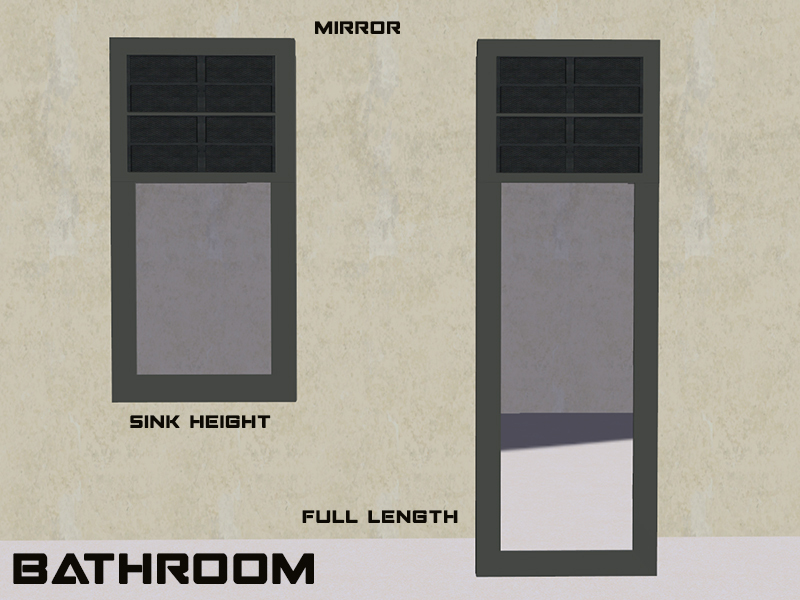 Egghead stuff: The door is based on Leefish's sliding door. The arch works like a regular maxis arch. 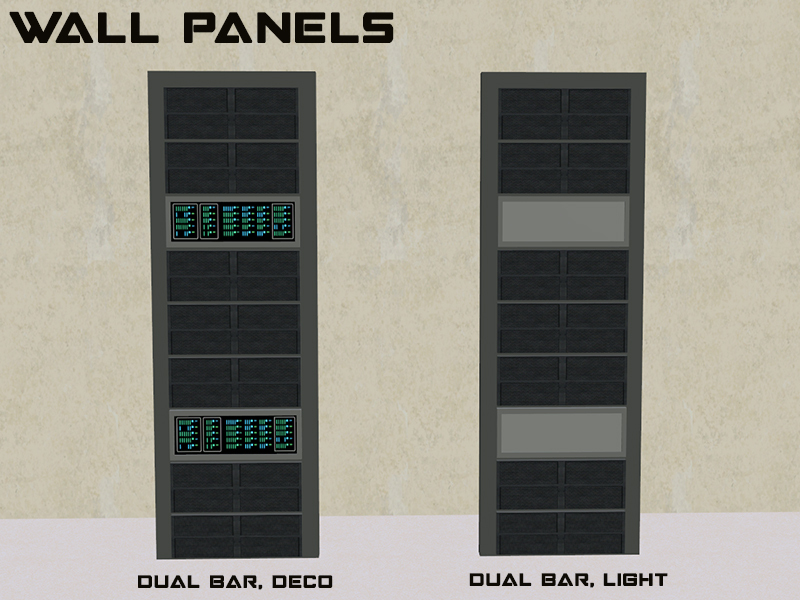 Both can be put on diagonal walls. 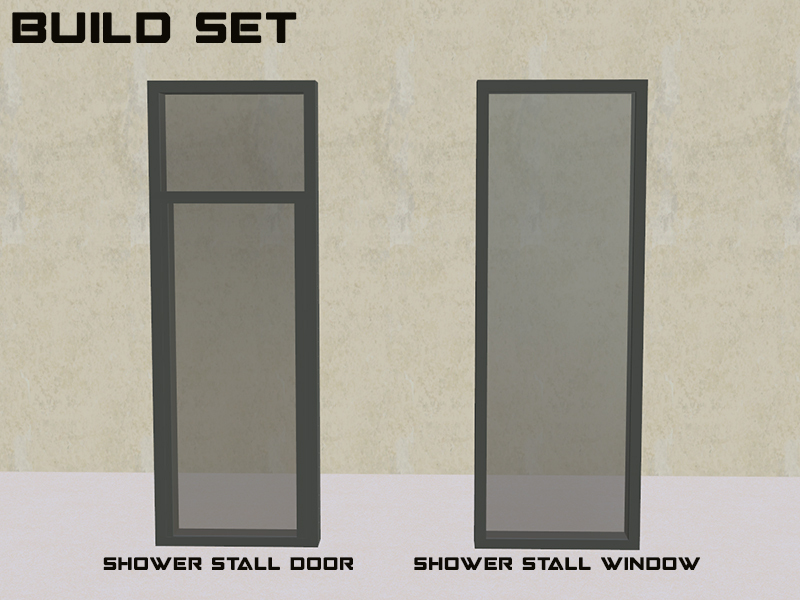 Egghead stuff: Glass door and window for building shower enclosures. 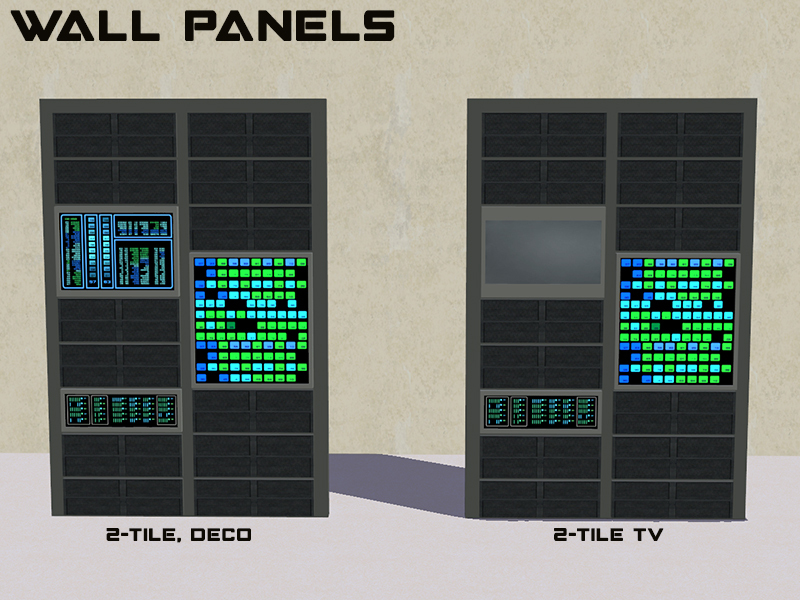 Both can be put on diagonal walls. Egghead stuff: They function like a Maxis computer and desk chair. 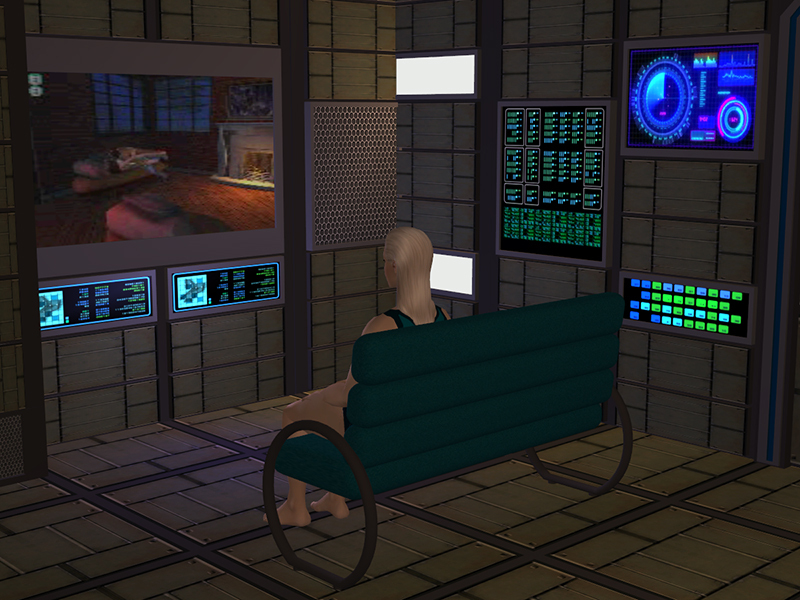 The terminal motitor texture is slaved to the master wallpanel from this seat. 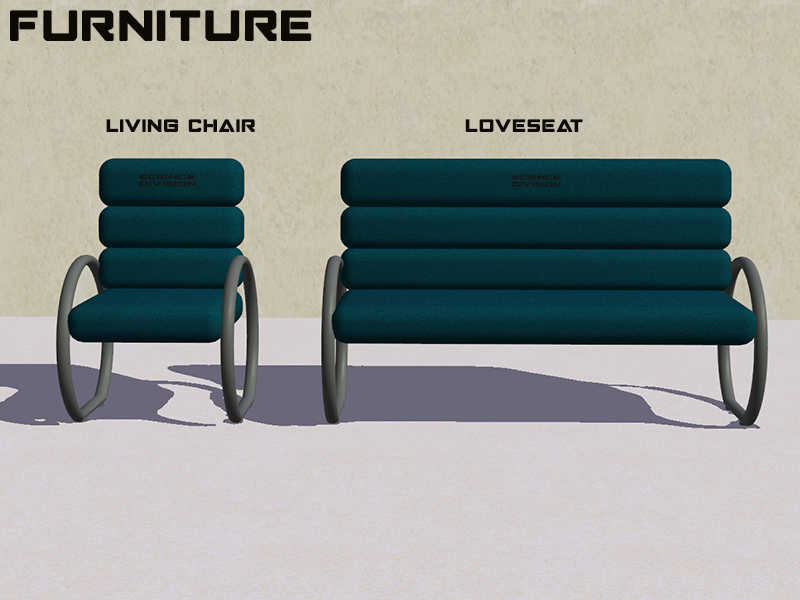 The chair is the master object for the living chair and loveseat. 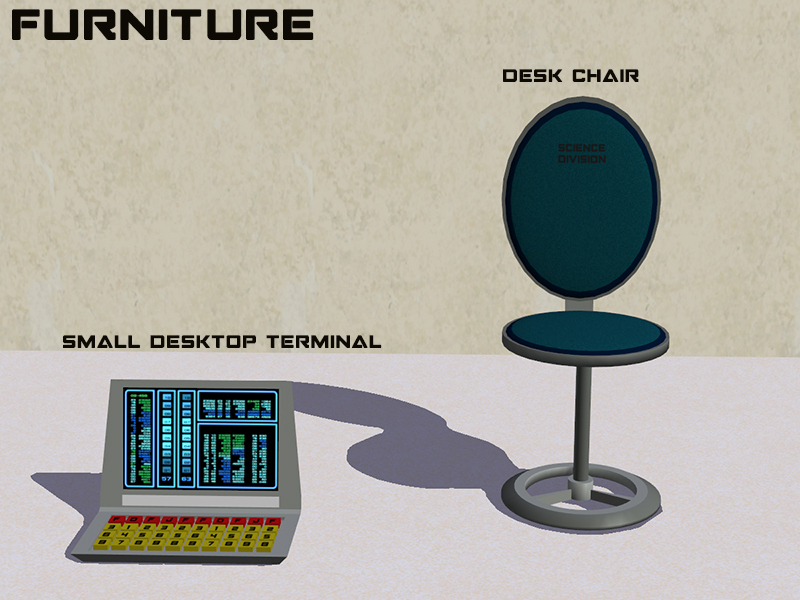 Egghead stuff: They function like a Maxis table and end table. The nightstand has an extra deco slot inside. 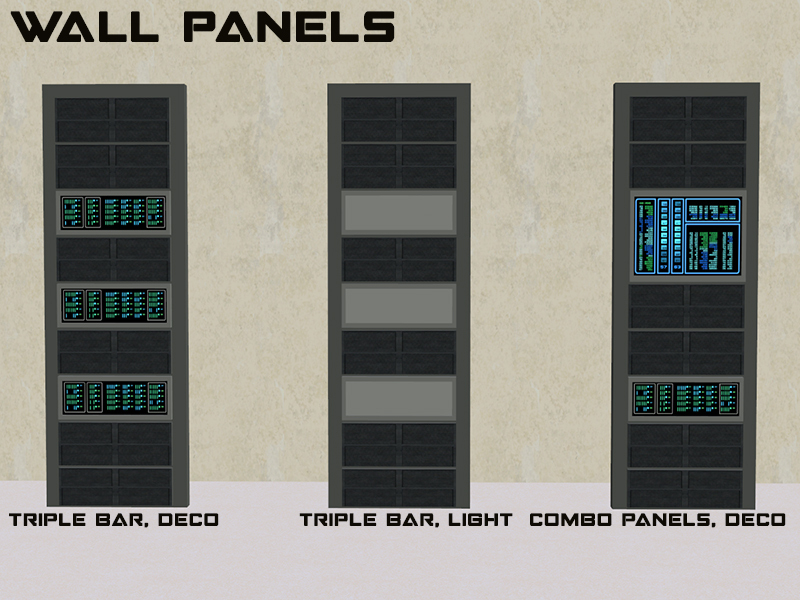 Egghead stuff: They function like Maxis gym lockers. Egghead stuff: They function like Maxis gym dressers. 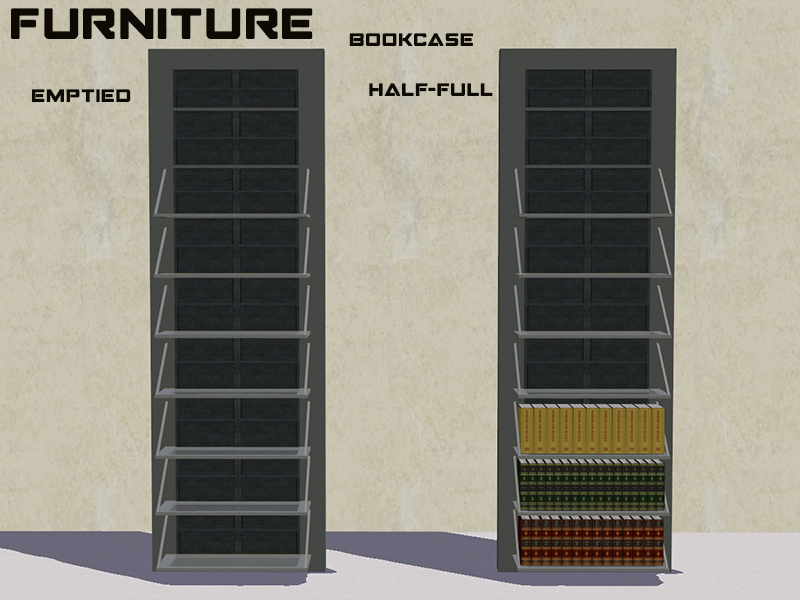 Egghead stuff: They function like Maxis bookcases. The empty shelves have three slots each for deco books and objects. 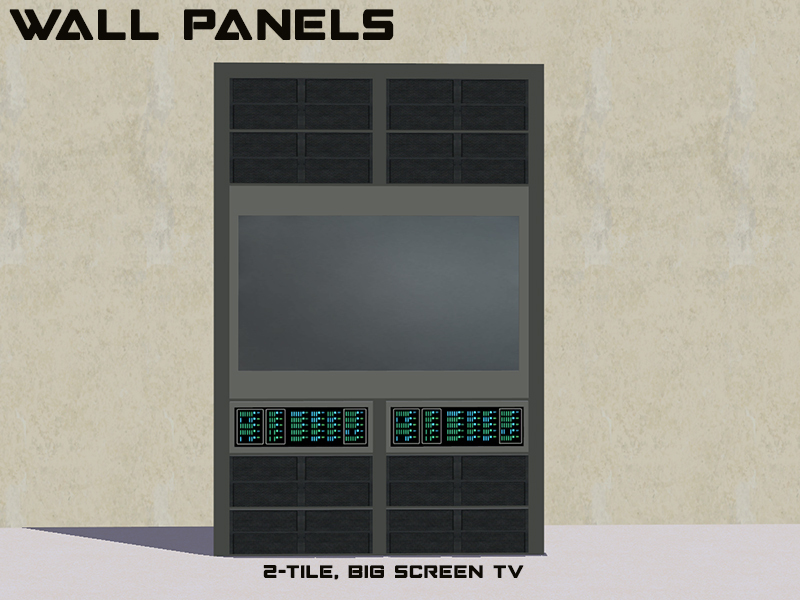 Egghead stuff: The TV can be placed on any surface or the floor, and works like a Maxis TV. The alarm clock is animated and works like the Maxis alarm clock. The table lamp is a functional lamp. The sound system works like a Maxis boombox. 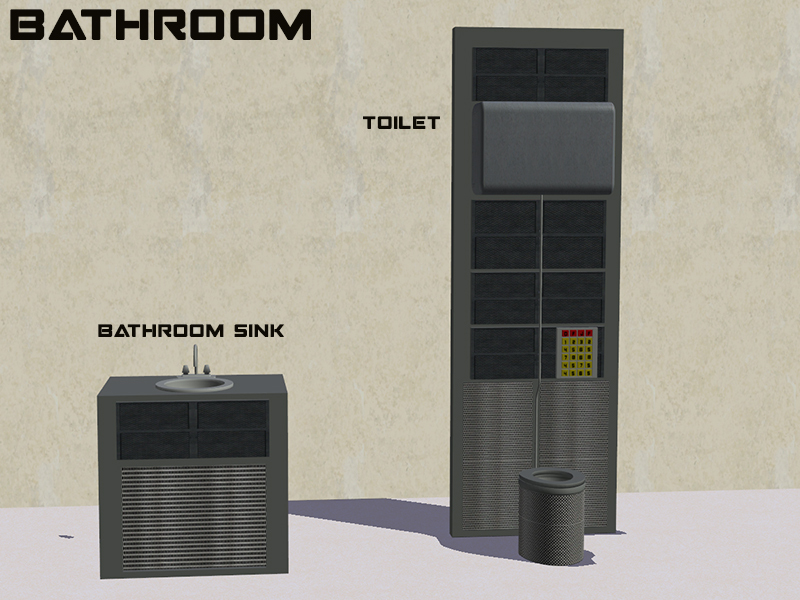 Egghead stuff: They function just like regular Maxis objects. 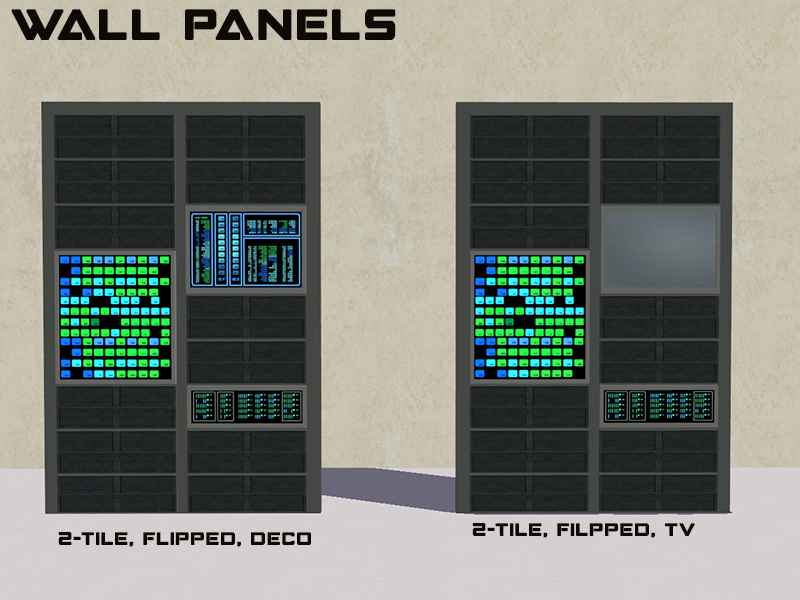 Egghead stuff: The panels are deco objects, wall lights, and TVs. 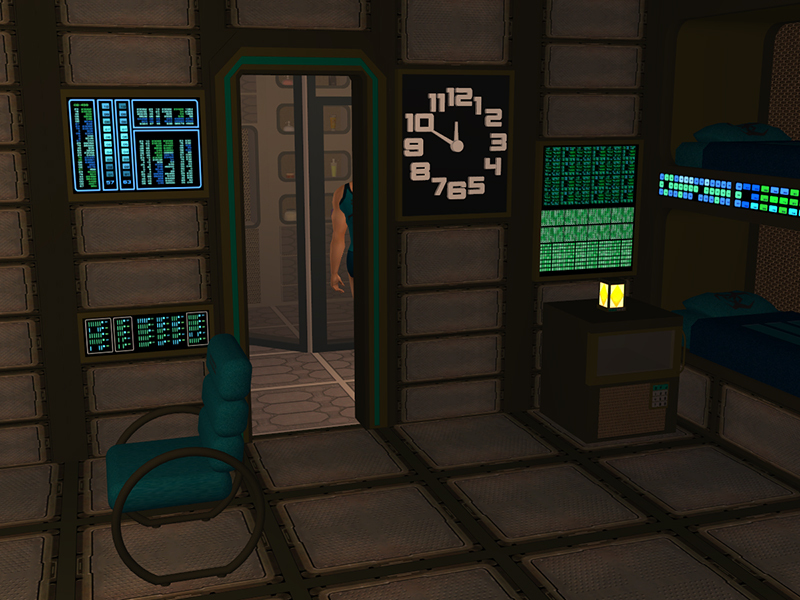 The wall clock is animated and works just like the Maxis clock. Everything else works just like the Maxis objects, nothing special. 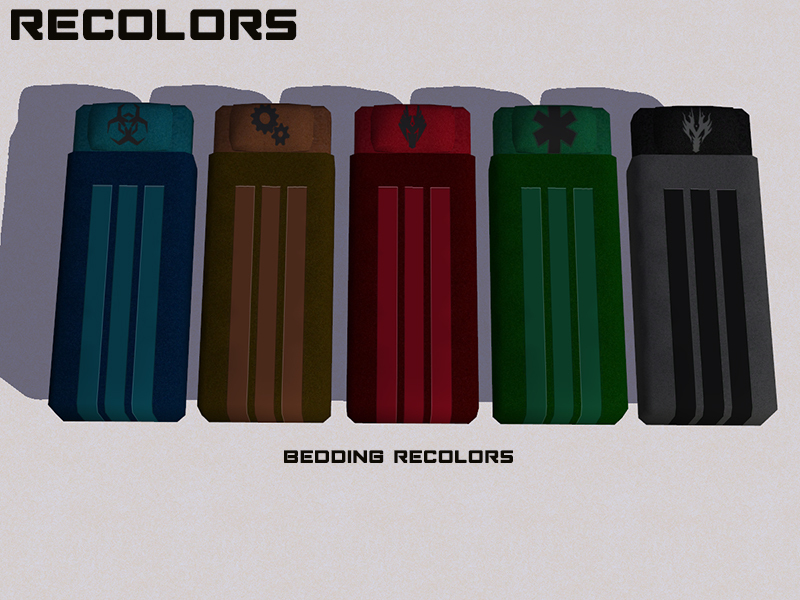 I made five division-specific bedding recolors. 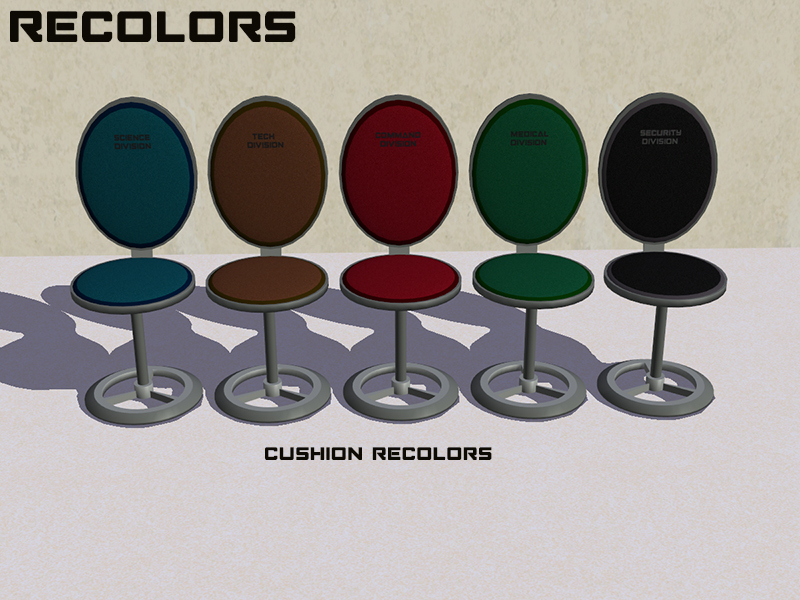 There are five color options for the cushions. 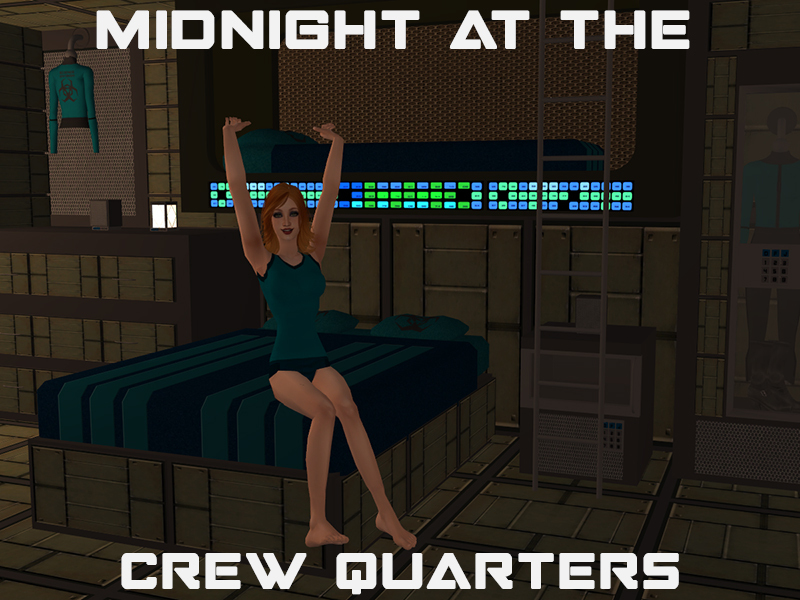 Everything you need to set up your Sim's personal quarters on Midnight Station. Warning: I pixelated all the cash n' prizes, but still possibly NSFW-ish. 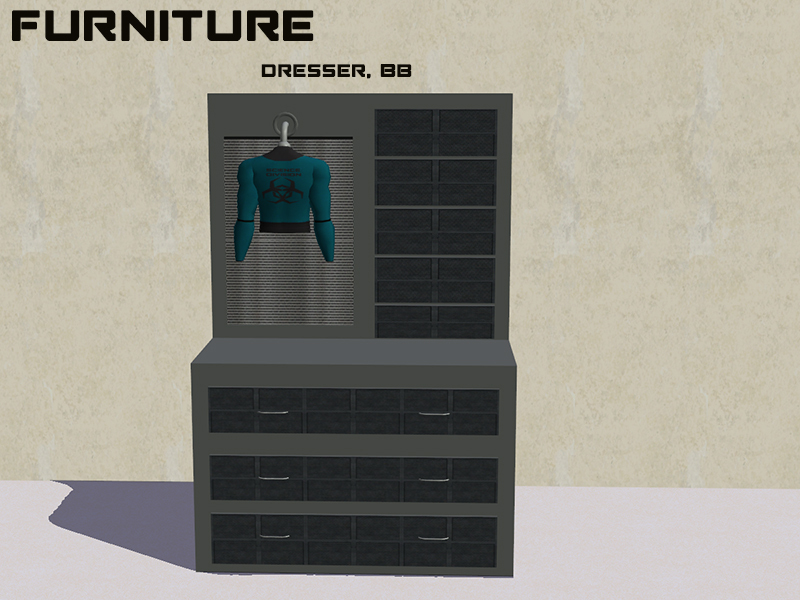 What an amazing furniture set! It's always a pleasure to visit your site. Thank you, Jason. Glad you like it. This is a fun set. Much more to come! Thanks, the collection is great. Espero que el traductor de G. haya hecho bien su trabajo. Jajá. Hi, Coni. I'm glad you like it. Much more coming soon. Just getting back into TS2 and I'm amazed at all the great cc still being created. I'm so impressed, thank you so much for this! Hi, there. Glad you like it. Enjoy! Wow! What a great set! 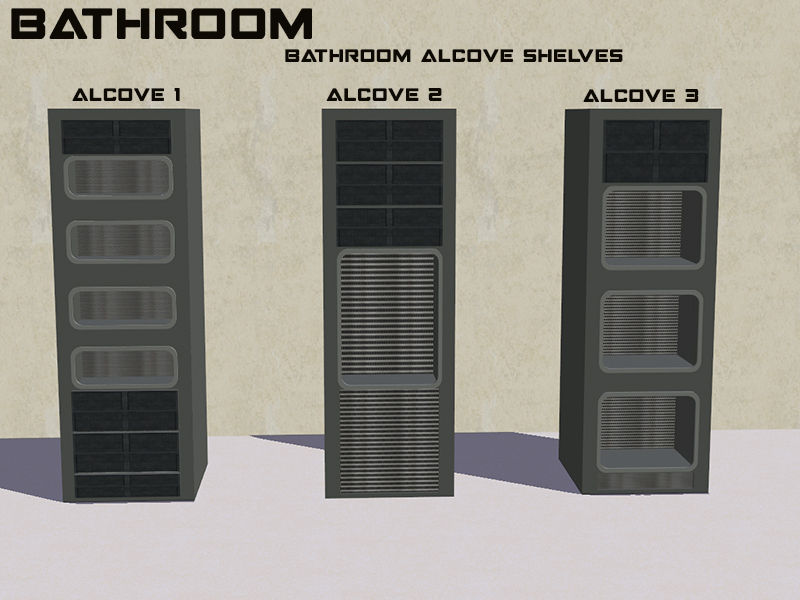 So many goodies in here (shelves with slots, yay!)... this set will definitely get used and abused in my sci-fi game. Thank you! Glad you like them. 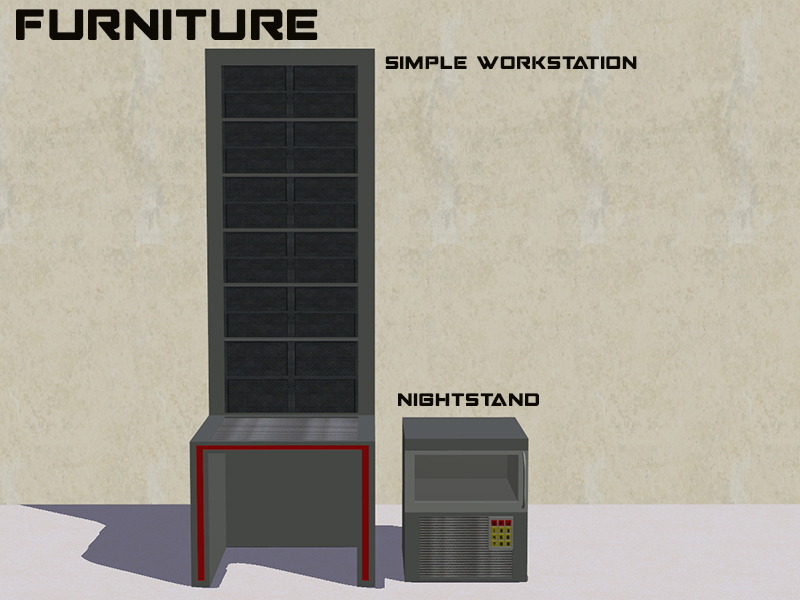 This is the first of probably three planned "regular" (non-themed, functional furnishing) sets for Midnight. 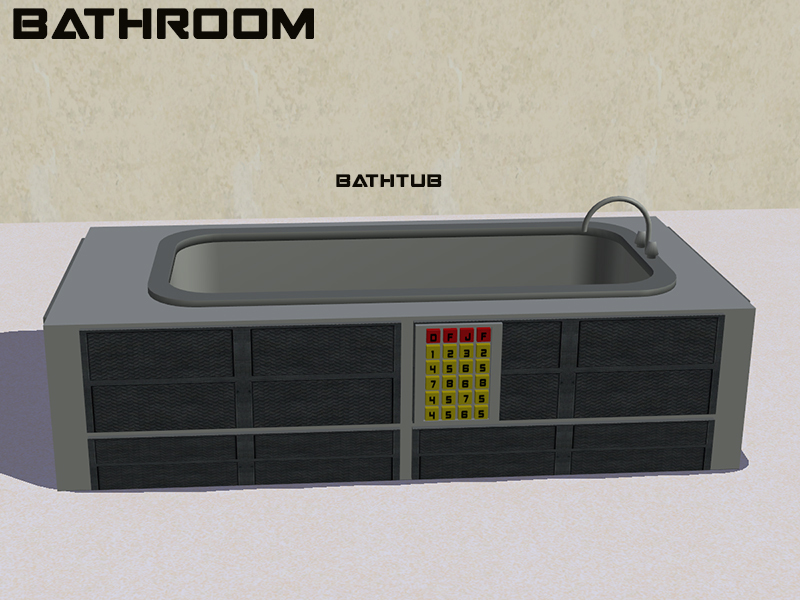 Eventually there will be a kitchen/dining room/replimat set and a community/rec/shopping set. 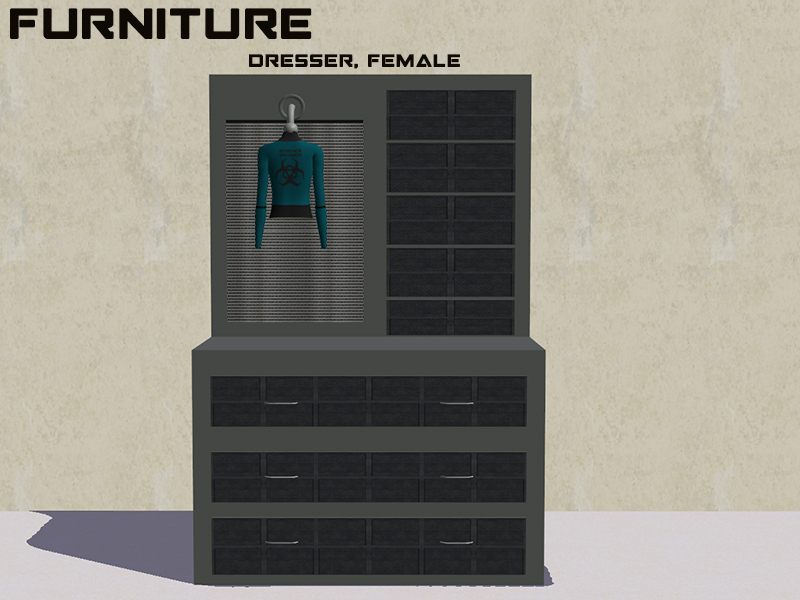 I tried to fill this set with bawbees and gewgaw to build seamless personal quarters. I don't have a whole lot of clutter-y things in my downloads folder. 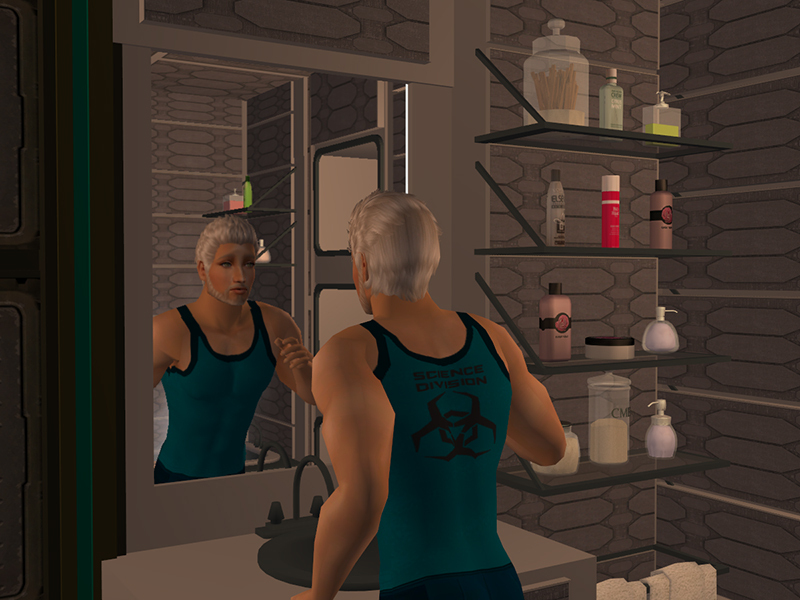 Right now, I'm just running with a few ATS bathroom deco things and Cassandre's cosmetics deco. The "breadsticks" are part of her Petra set and I think they were intended to be sponges or Q-tips or something.